The Internal Revenue Service reminded certain tax-exempt organizations that the Tuesday, May 15 filing deadline for Form 990-series information returns is fast approaching. Need more time to work on your papers or need extra time? 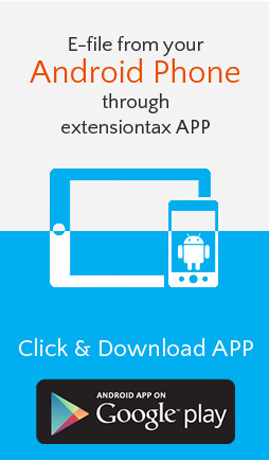 then request IRS for additional time by filing extension tax form 8868 online at http://ExtensionTax.com and push your Due Date from May 15, 2018 to November 15, 2018. Form 990-series information returns and notices are normally due on the 15th day of the fifth month after an organization’s tax-year ends. Many organizations use the calendar year as their tax year, making May 15, 2018 the deadline to file for 2017. This entry was posted in Efile an Extension tax, efile form 8868, efile income tax extension, efiling Easy Extension, file extension online, Form 8868, Get instant Extension, Online Extension, Tax Extension and tagged 6 months extension of time, 6-month tax extension, automatic 6 month extension, efile tax form 8868, electronic filing for tax form 8868, extend your income tax due date by 6 months, extension for tax form 8868, Extension of Time, Extension Tax, extension tax e file, Extension Tax EFile, extension tax form 8868, Extension Tax Online, extension tax return, extension tax return efile, extension tax return online, Form 8868 eFile, Form 8868 online, Tax Extension, tax extension e file, tax extension efile, tax extension electronic filing, tax extension is $9.99, tax extension online, tax form 8868, tax form8868 online on May 14, 2018 by TaxExpert. 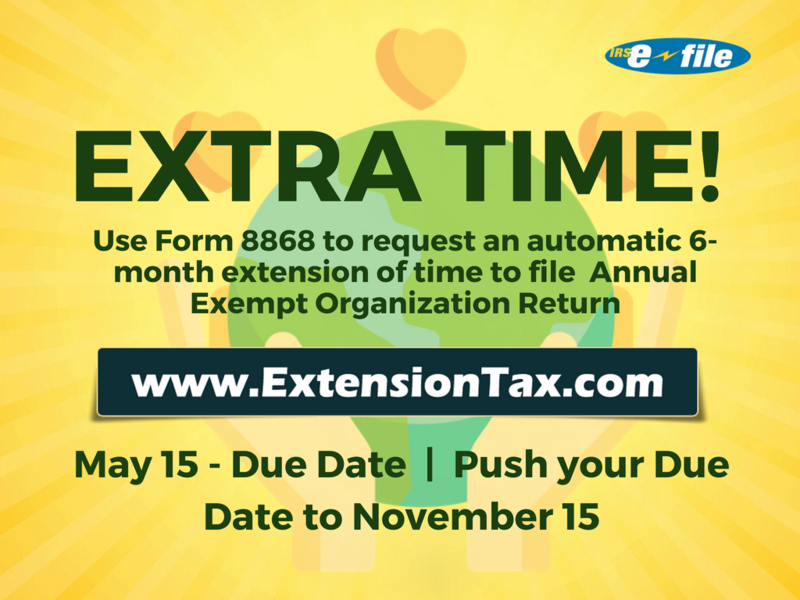 The Extension Tax Form 8868 for Application for Extension of Time to File an Exempt Organization Return is now Due on May 15th, just couple of days left. 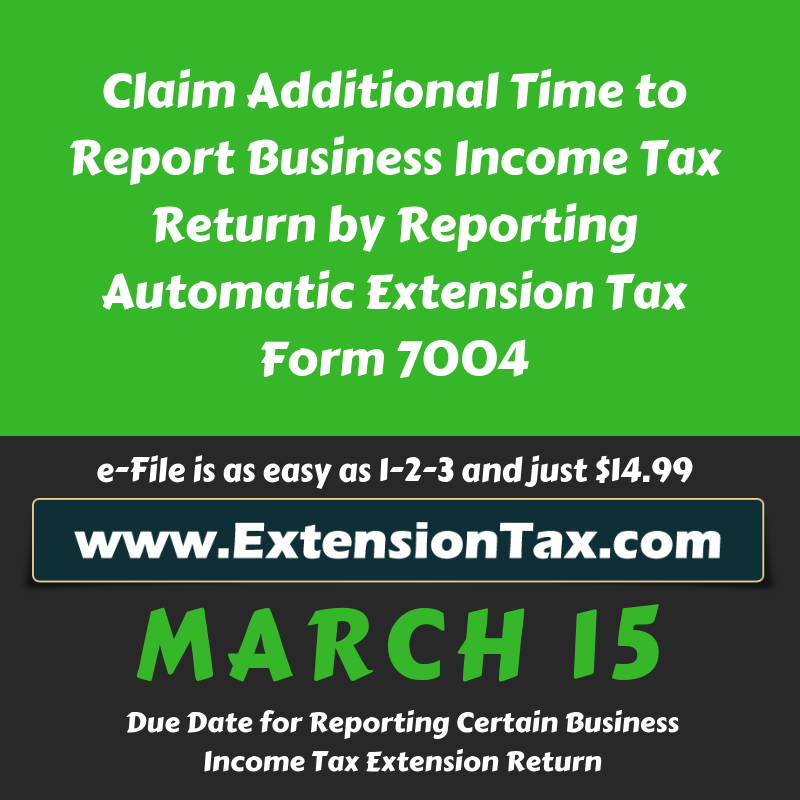 Form 8868 is used by an exempt organization to request an automatic 6-month extension of time to file its return and also to apply for an additional (not automatic) 3-month extension if the original 6-month extension was not enough. This entry was posted in Efile an Extension tax, efile form 8868, exempt Organisation, Extension form, file extension online, Form 8868, Get instant Extension, IRS Extension, Online Extension, Tax Extension, Tax Return Preparers and tagged 6 months extension of time, 6-month tax extension, automatic 6 month extension, efile tax form 8868, electronic filing for tax form 8868, extend your income tax due date by 6 months, extension for tax form 8868, Extension of Time, Extension Tax, extension tax e file, Extension Tax EFile, extension tax form 8868, Extension Tax Online, extension tax return, extension tax return efile, extension tax return online, Form 8868 eFile, Form 8868 online, Tax Extension, tax extension e file, tax extension efile, tax extension electronic filing, tax extension is $9.99, tax extension online, tax form 8868, tax form8868 online on May 10, 2018 by TaxExpert. 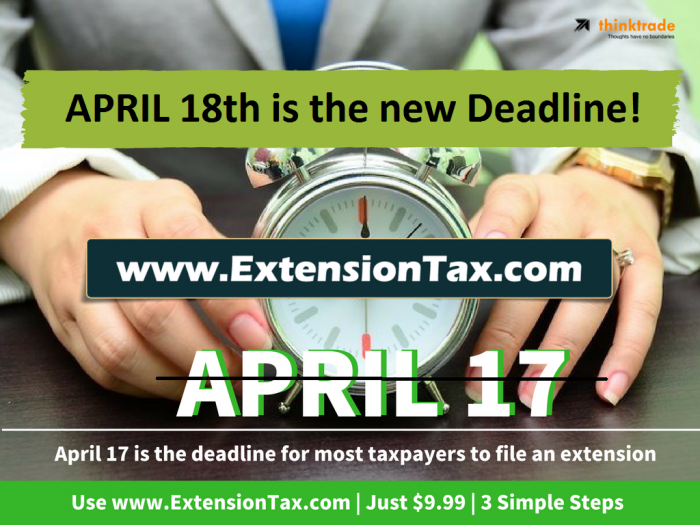 In the recent IRS issue (IR-2018-92, April 13, 2018), highlighted the April 17 deadline for filing tax returns and if you’re not ready then file for extension, the automatic extension tax pushes your due date to October 15. As the April 17 tax filing deadline approaches, the Internal Revenue Service is reminding the nearly 40 million taxpayers who have yet to file their tax returns that there are a variety of options to help them in the final days of the tax filing season. IRS tax help is available 24 hours a day, seven days a week on IRS.gov. Whether filing a tax return, requesting an extension or making a payment, the IRS website can help last-minute filers on just about everything related to filing taxes. Information about free e-file options, such as FreeFile, how to request an automatic six-month filing extension or fast and easy ways to pay any tax due using IRS Direct Pay are available online at IRS.gov. The busiest part of tax season begins this week, with millions of people planning to file. Through April 6, the IRS has processed more than 101 million tax returns and issued more than 79.1 million tax refunds totaling $226.6 billion. The average refund to date is $2,864. This entry was posted in Efile an Extension tax, efile extension form, efile income tax extension, efiling Easy Extension, Extension form, Extension Tax, Fast and easy return, file extension online, Form 4868, Form 4868 efile, Form 7004, Get instant Extension, IRS Extension, Online Extension, Tax Extension, Tax Return Preparers and tagged 6 months extension of time, 6-month tax extension, April 17 deadline, April 17 due date, Efile Form 4868, extend your income tax due date by 6 months, Extension Tax, extension tax e file, Extension Tax EFile, Extension Tax Online, extension tax return, extension tax return efile, extension tax return online, tax 4868, tax 4868 efile, Tax 7004, tax 7004 efile, Tax 8868, tax 8868 efile, Tax Extension, tax extension e file, tax extension efile, tax extension electronic filing, tax extension is $9.99, tax extension online on April 16, 2018 by TaxExpert. 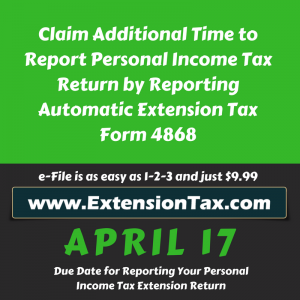 The Internal Revenue Service reminds taxpayers who may have trouble meeting the April 17 tax filing deadline that e-File provides an easy, online option to get more time. Taxpayers submitting Form 4868, Application for Automatic Extension of Time to File U.S. Individual Income Tax Return, will automatically be granted a six-month filing extension. This is the seventh in a series of nine IRS news releases called the Tax Time Guide, designed to help taxpayers navigate common tax issues. 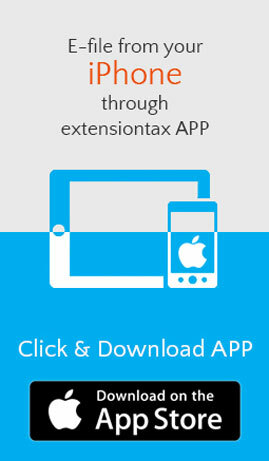 The IRS offers the extra time to file, automatically, to all taxpayers requesting it. A filing extension allows taxpayers until Oct. 15 to gather, prepare and file their taxes with the IRS. However, it does not extend the time to pay any tax due. This entry was posted in Efile an Extension tax, efile income tax extension, efiling, file extension online, Online Extension, Tax Extension, Tax Return Preparers and tagged 6 months extension of time, 6-month tax extension, Efile Form 4868, extend your income tax due date by 6 months, Extension Tax, extension tax e file, Extension Tax EFile, Extension Tax Online, extension tax return, extension tax return efile, extension tax return online, tax 4868, tax 4868 efile, Tax 7004, tax 7004 efile, Tax 8868, tax 8868 efile, Tax Extension, tax extension e file, tax extension efile, tax extension electronic filing, tax extension is $9.99, tax extension online on April 12, 2018 by TaxExpert.